From July 10 to 22, 2017, a.r.t.e.s. 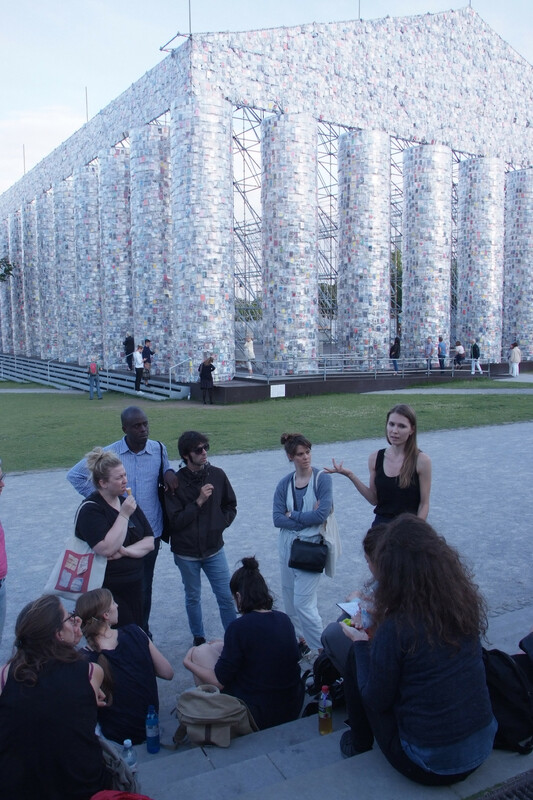 alumna Francesca Valentini led the interdisciplinary summer school “Contemporary Art in the Global Present.” Seventeen participants from Italy, Greece, Germany, Canada, and Austria set on a mutual journey across Europe to explore the decade’s major international exhibitions of contemporary art. Although the group of advanced M.A. students, doctoral candidates, and post-docs represented diverse academic disciplines (art history, cultural studies, anthropology, political science, sociology, linguistics, and Chinese studies), everyone shared an interest in the cultural, social, political and economic implications of the so-called “SuperKunstSommer.” The epithet refers to the decennial concurrence of the Venice Biennale, documenta, and Skulptur Projekte Münster. 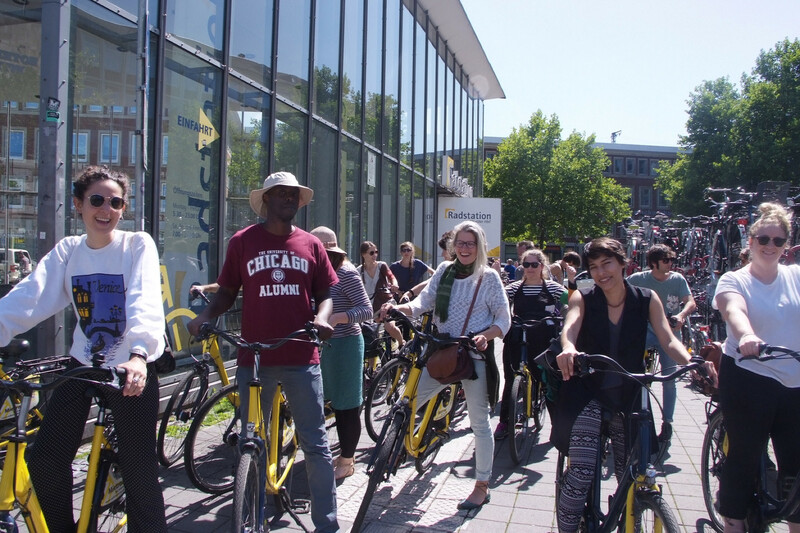 This year it also became the itinerary of the DAAD-funded summer school, which was held by the a.r.t.e.s. Graduate School in collaboration with the Department of Philosophy and Cultural Heritage of the Università Ca’ Foscari Venezi and the Department of Communication & Media Studies of the National and Kapodistrian University of Athens. 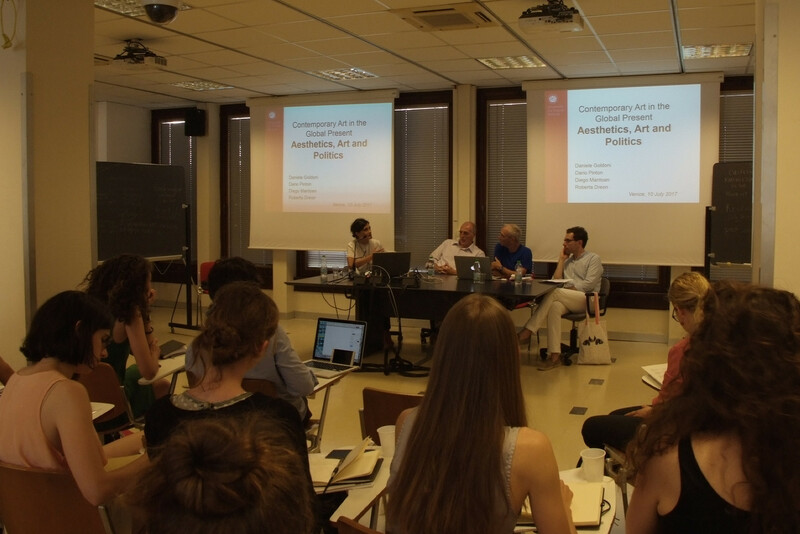 The summer school commenced in Venice. 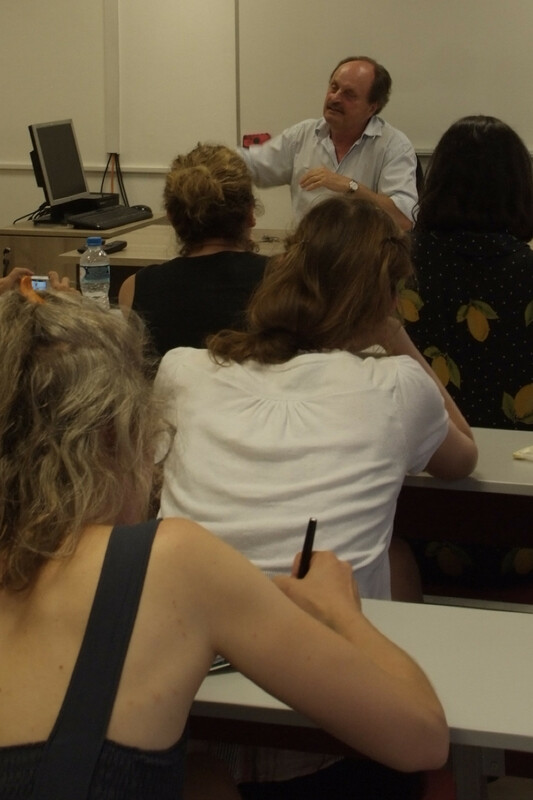 On the first day, the Department of Philosophy and Cultural Heritage at Università Ca’ Foscari Venezia welcomed the participants with nutrition for the mind and body–the round table “Aesthetics, Art and Politics” followed by an apericena. The introductions of individual research goals and discussion of common questions set the tone for the collective learning experience of the entire journey. 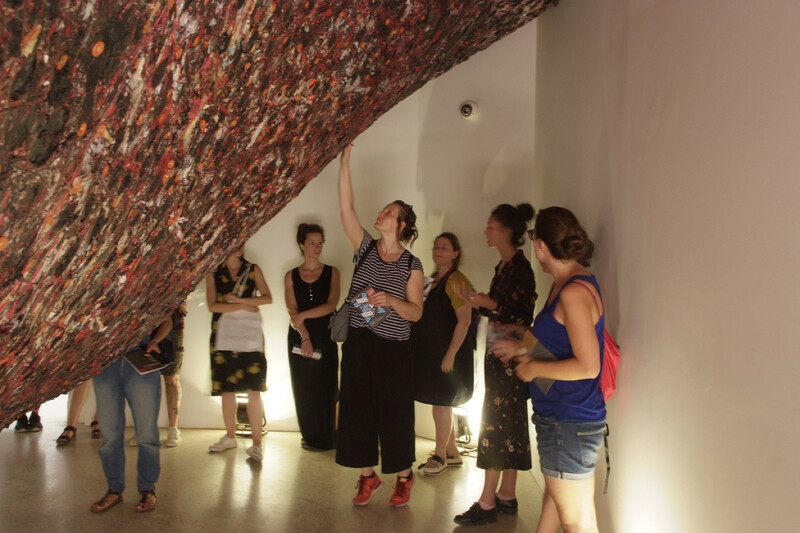 In Venice, the group spent the next three days visiting the 57th Venice Biennale: the main exhibition VIVA ARTE VIVA curated by Christine Macel of the Centre Pompidou as well as the national pavilions. Broadening the scope of art experience, the participants spent one night attending the outdoor theatre play “To DA or not to DA?” staged by the School of Drama of the Aristotle University of Thessaloniki. On the last day in Venice, the summer school returned to the classroom for two thought-provoking lectures: “Biennials on the Prairie: Blindspots in Contemporary Biennalogy” by Dr. Matteo Giannasi (Venice) and “Conditions of Togetherness: Unfolding the Guest-Host duality in the context of documenta 14” by Mirela Baciak, M.A. (Vienna). The latter produced a pertinent transition to the group’s arrival in Athens on the following afternoon. documenta is a large-scale quinquennial exhibition of international contemporary art that was founded by the German architect, artist and curator Arnold Bode in 1955 and has traditionally taken place in his hometown, Kassel. The artistic director of documenta 14, Adam Szymczyk, made a decision to split the exhibition of 2017 between two cities: Athens and Kassel. 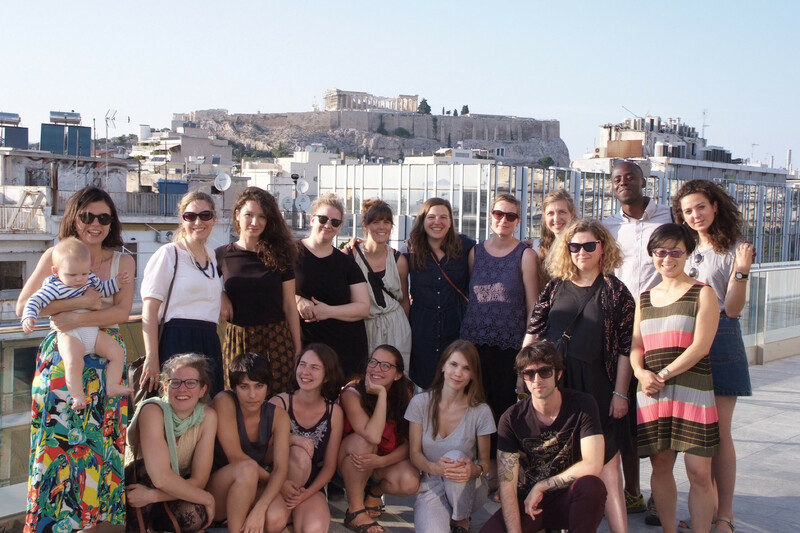 Following his concept of starting the documenta journey from the former to the latter, the summer school spent three days in the Greek capital. In order to understand the motivations of Szymczyk and his curatorial team in relation to the current situation in Athens, it was necessary to grasp the historical and socio-political context of the location. That is why, preceding the group’s visit of the exhibition venues, the lecture “Learning from Athens? Is Crisis Becoming a Post-Democratic Regularity? Austerity, Inequality, Autarchy” by Prof. Dr. Dimitris Charalambis’ (National and Kapodistrian University of Athens) proved to be especially beneficial. Further the program included collective investigation of the Athens Conservatoire (Odeion), EMST (National Museum of Contemporary Art), the Benaki Museum, and Athens School of Fine Arts; leaving enough time for individual selection and exploration of other documenta 14 locations. One of the highlights among manifold activities in Athens was an extensive conversation with a curator from Szymczyk’s team, Hendrik Folkerts. 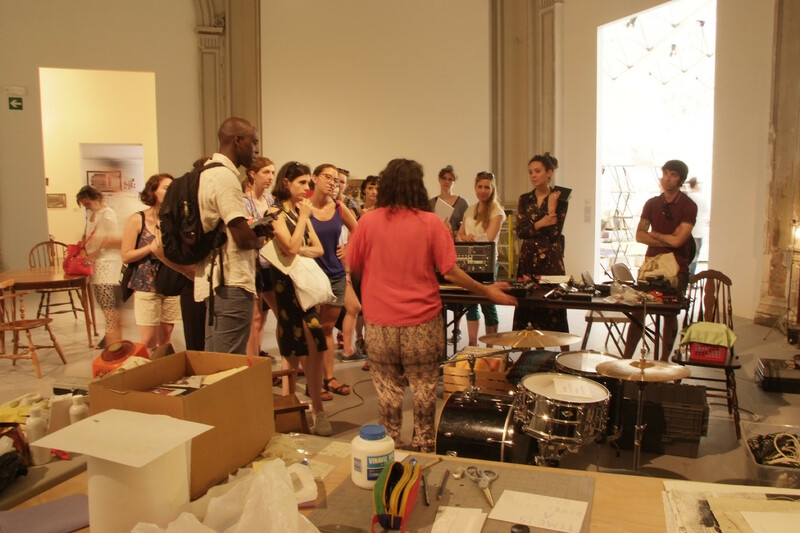 Folkerts spoke about curatorial planning, choice of venues, and organizational difficulties, and afterwards generously responded to a flood of complex questions. 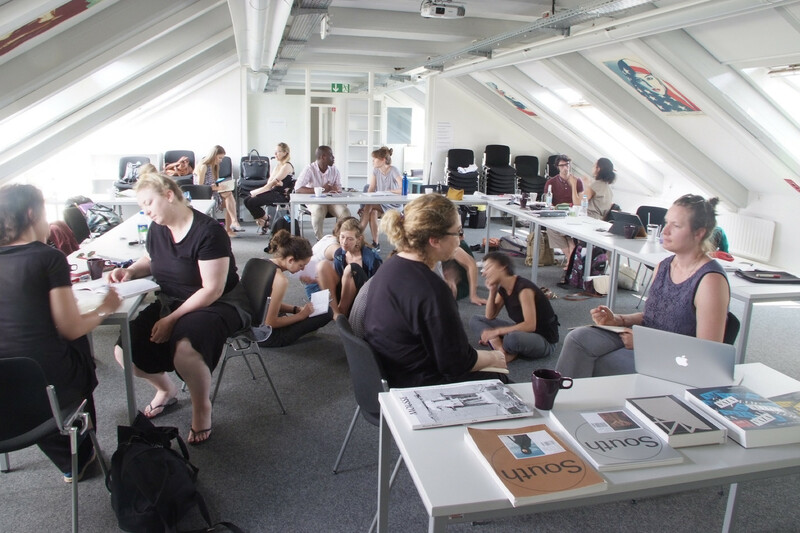 The second week of the summer school took place in Germany: Kassel, Münster, and Cologne. The visit of the exhibition in Kassel was well complemented by meetings with people working on and around documenta 14. 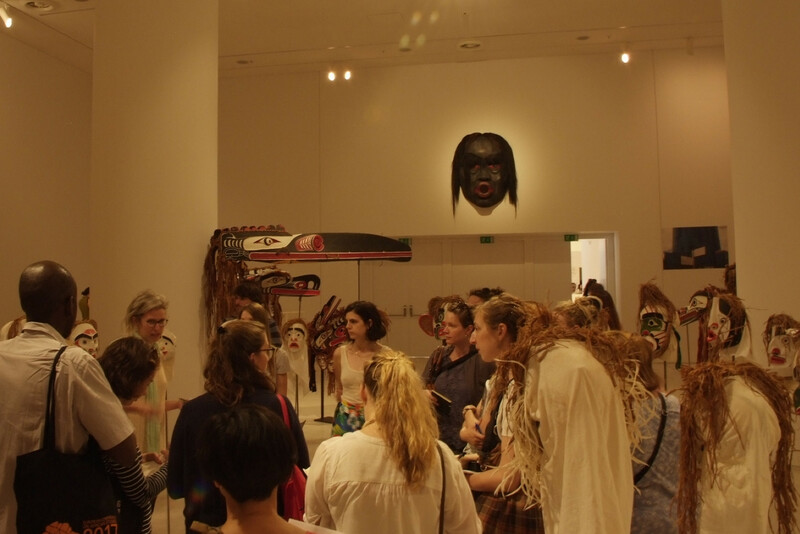 The group had an opportunity to speak with several leading members of d14: curator Candice Hopkins, Communications Coordinator Caroline Kim, Head of Education Sepake Angiama, and Director of the documenta Archives Dr. Birgit Jooss. In particular, a private tour of the archives sparked a lot of interest in the group, while Dr. Jooss shared the short- and long-term plans of the archives and the documenta institute. 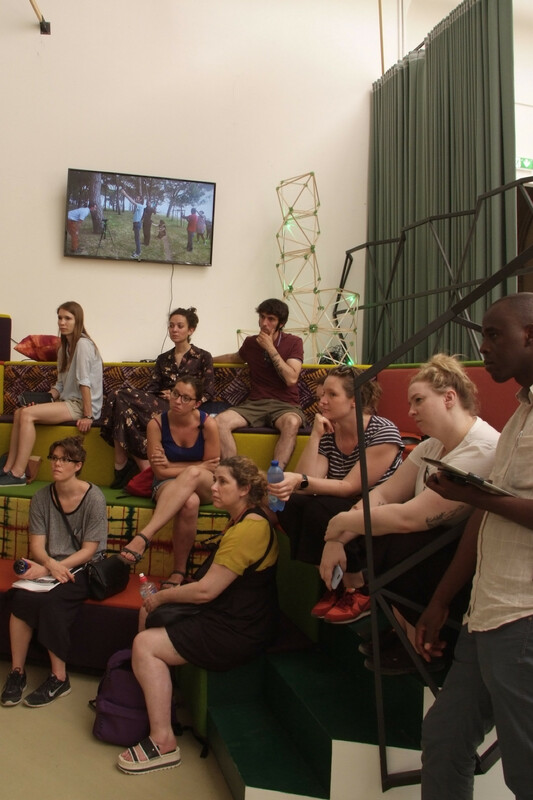 The collective exploration of exhibition venues was marked by engaging on-the-spot discussions and presentations of artworks or artists given by the summer school participants. For the final art experience the group went to Münster, where the day was devoted to exploration of public site-specific sculpture by bike and, in the evening, to one of the Blumenberg Lectures: “Contemporary Art Between the Regional and the Global” by Dr. Alexander Alberro (Columbia University, New York). The journey, or better said a great learning adventure, concluded in Cologne, where we were greeted and welcomed by a.r.t.e.s. director Andreas Speer. 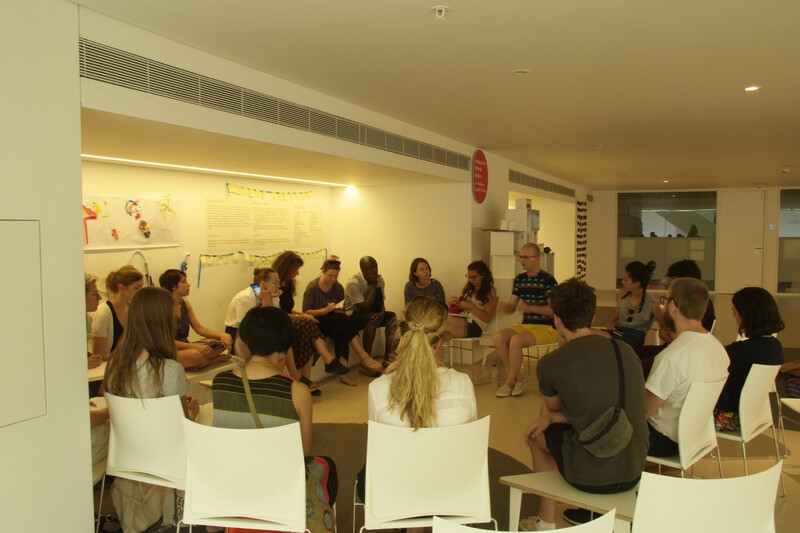 Working at the premises of the a.r.t.e.s., the participants prepared questions and conducted Skype-interviews with the EMST Director Katerina Koskina, Curatorial Advisor of the d14 in Athens Marina Fokidis, and one of the d14 artists, Irena Haiduk. Afterwards, we enjoyed some time for reflecting on the summer school experience, organizing our notes and writing short reports. Over the course of two weeks, we have got to know one another and made friendships that we hope to preserve. Shared experience of art, vaporetto/train/plane/taxi conversations, and exchange of thoughts and ideas during long evenings at Campo Santa Margherita in Venice, on top of the Filopappou Hill in Athens, or in front of Marta Minujín's The Parthenon of Books in Kassel bonded the group despite the diversity of backgrounds and occupations. In fact, as many of us pointed out, the variety of perspectives sharpened our experiences and facilitated the learning process. Francesca Valentini’s idea of collective exploration has proved to be a success. 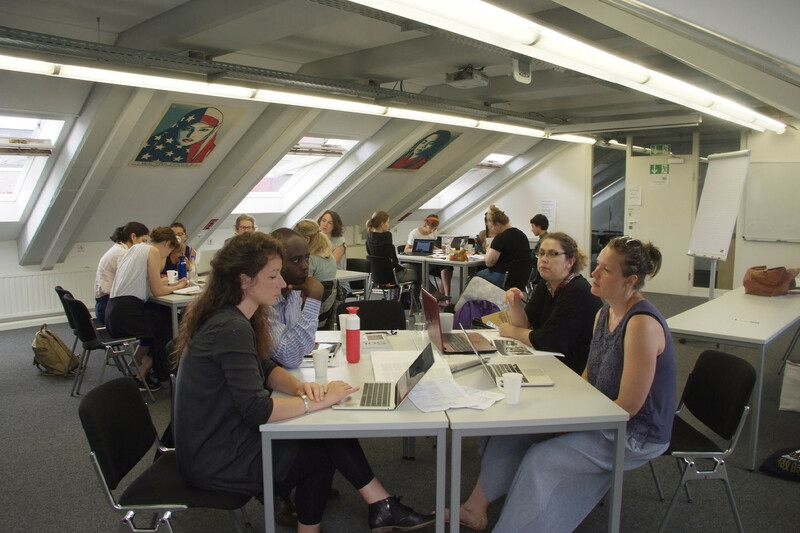 The summer school was funded by the DAAD.